For information about the live-stream event, click here. Millions of people across the planet are waking up to the devastation that our eco-systems have endured through the population and technology explosions of our modern times. Earth Day is a recognition that healing is needed, and though it has valuable roots in activism, it is our belief that the personal, internal dimension is crucial to the healing that is needed. That’s why we are presenting a Global Ho’oponopono Ceremony and Facebook Live on the day before Earth Day. The Cooperatist Movement is dedicated to teaching the importance of cooperation over competition, because the global issues we face as a species will require an unprecedented unified movement. In exploring the reasons that humans have a hard time cooperating, and there are many of them, we have boiled it down to personal wounds, mistrust, and out-dated narratives about who we are. 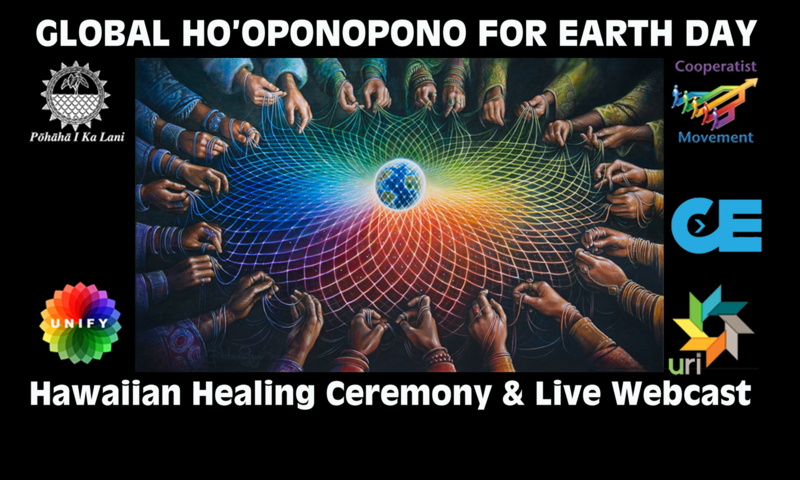 The Hawaiian Cultural Practice of Ho’oponopono is derived from traditional chants that are meant for clearing these blockages and mending severed relationships with self, community, and the land. The stories and varying styles of practice provide a valuable roadmap for people to take steps towards inner peace and clarity as well as creating this within their community. Though the tradition is born in Hawaii, we feel that it is a beautiful teaching that will help us all on our journey to bring more healing to our communities and our planet. For a brief excerpt from the Bishop Museum book, Nā Mo’olelo Lomilomi: The Traditions of Hawaiian Massage and Healing, click here. The Ho’Opae Pono Peace Project also has this beautiful description of Ho’oponopono along with terms that describe the process. We have partnered with a number of outstanding global organizations as well as Pōhāhā I Ka Lani, a respected local educational non-profit on the Big Island of Hawaii. Please take the time to read through our Partners Page and support their valuable work in the world!